Who's ready for summer?!! Instantly download cute signs to use in your home or office, did I mention they're FREE?! You'll instantly access all 5 designs plus a quick & easy recipe perfect for summer nights on the patio. Cheers to savoring summer! Okay, so stay with me on this. We've all heard that the life you want is just outside of your comfort zone. Fear can sometimes point the way. I think we can sense when we're getting close to something important and that's when we tend to hold ourselves back. We may mentally press pause. We stop moving forward with decisions. We make ourselves busy to avoid thinking about it - hello distractions. This week I want you to write down 1 area in your life where you've been holding back. Maybe you're even frozen, crippled in fear from moving forward. Stop and really examine why. We've all been there. Remember that not making a decision is actually making a decision. Forget all the reasons why it won't work and start focusing on all the reasons why it WILL. This is where we have to be intentional. Stop waiting until we're not afraid. Feel the fear, but do it A N Y W A Y. Action combats fear. Instantly Download our FREE Dreams + Goals Quick Start Guide here. Are you a Shutterbug? Submissions Now Open for 2019! Sampling of 2018 featured photos. Did you know we crowd-source all of the photos featured in our Heart of the Farm Planners? Great News, submissions are now open until April 3rd, 2018 & it's FREE to enter! 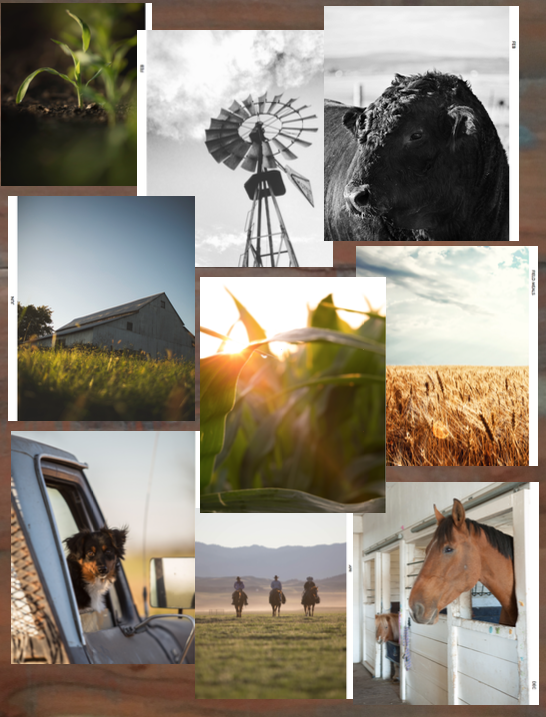 We're on the hunt for the best farm lifestyle photos with heart to be featured in our 2019 Planners! Last year we received over 600+ entries. If you take amazing photos that tell the farm lifestyle story in pictures I'd love to help you share them with the world. Or if you have friends or family who would love this opportunity I'd love it if you'd share this email with them too! Simply email photo entries to farmwife@heartofthefarmplanner.com by April 3rd! Please note, vertical composition is displayed best on the beautiful full color tabs! A maximum of 12 photos may be submitted per entrant. Selected winners will be notified after April 30th. All winners selected for free print feature will receive a 2019 planner with the selected photos being featured in the planner along with photo credits advertising your name, website and/or social media site(s). Last year our planners reached 49 of the 50 states in the United States, Puerto Rico, all over Canada as well as Australia. I'd love for you to join in on the fun! We all know there's nothing special about January 1st. Let go of the guilt of not starting when the calendar flips over to exactly January 1st! Or maybe you haven't set your goals yet - that's okay! We all have this big beautiful year stretched out in front of us, unwritten. What is on your heart to do, achieve or become? I think we all owe it to ourselves and our world to approach the days, weeks and months ahead with expectant hope for our very best year yet. The world and your people need you to bring your best! What is your vision for your best life? Take time to get clear before you set any goals. Because there is a lot of really good stuff, but I want you to only go after the very BEST. In our busy world today and with technology always pulling at our attention we must master our focus and laser in on what matters. We must say Yes to the Best and let go of the rest! Your most precious gift is your time and attention, let's be fearless and take control of our calendar this year and make it a place for the things we are passionate about and let go of mere busy work. Jump start your journey by grabbing our FREE Dreams & Goals Fresh Start Guide here.